equestrian life | Chronicles of a "Mini-Pro"
During the Rio Olympics, my Facebook feed was utterly blowing up with comments regarding Dutch dressage rider Adelinde Cornelissen, and her choice to retire mid-test on her veteran partner, Parzival. Just a day or so earlier, Parzival had been found with a fever and swollen jaw, determined to be the result of a bite from some foreign bug. Under the supervision of FEI veterinarians, the horse was treated with fluids; as the swelling and fever reduced, Parzival was given clearance to compete. However, Cornelissen felt that her horse did not feel right and that it was inappropriate to continue to push him to complete the demanding Grand Prix test. Initially, Cornelissen was lauded as a hero for putting the needs of her horse ahead of medal aspirations. But quickly the backlash began. Accusations of horse abuse were rampant. Implications that the true cause of the swelling was a hairline fracture of the jaw as the result of Cornelissen’s training methods became a common chant. Cornelissen and Parzival have been staples on the Dutch international team for years. They were the alternates for the 2008 Beijing Olympics, and at the 2012 London Games her team earned the bronze and Cornelissen, the individual silver. They have had numerous other successes in the international ring, but also some lows. The most notable of these occurred at the 2010 World Equestrian Games, when the pair was eliminated due to blood in the mouth, allegedly the result of the horse biting his tongue. The 2016 Rio Games were almost certainly intended to be the 19 year old horse’s final competition. Parzival was disqualified from the 2010 World Equestrian Games after blood appeared in his mouth. I am not a huge follower of international equestrian sport, but I watch and see enough that I usually know the key players and the major events. Since the days of the great rivalry between Van Grunsven and Werth, the Dutch riders have frequently been criticized for the use of rollkur in their training system. Of course, the Dutch say that the method they use is different than rollkur—I think they call it “low, deep and round”—and for people who live in that world, the similarities and differences between the two techniques could be debated for hours. For the greater equestrian community, the 98% of us who do not exist in the world of elite dressage performance, the line between the two methods is very, very blurry. The FEI was finally forced to take a firm stance against the use of rollkur largely as the result of public pressure. Low, deep and round is still allowed, within certain parameters; this ruling still rankles some within the equestrian community. From what I understand, Cornelissen has been frequently accused of using rollkur, and many negative statements have been made specifically in regards to her riding style and performances with Parzival. Given the quite passive and osmosis-like manner in which I absorb information about most of these elite riders, I do feel that it is significant that the impression I have always had of her is that she perhaps uses less than classical training methods. I have utterly no foundation on which to base the impression other than the trickle of comments which come through social media, bulletin boards and occasional articles. But yet, the impression is there. Photos like this one, easy to find on the internet, do not do much to ease Cornelissen’s public image. Wait a minute here. Regardless of anything you might have thought or do think about this rider….she felt as though the horse was not right. She stopped performing her test. It is almost a certainty that her decision to retire put the Netherlands out of medal contention as well. She chose to retire anyway—and I am sure the pressure to produce a winning test was extremely high, given that the Netherlands is a nation which actually enjoys and follows equestrian sports. In spite of all of this…she stopped. How could this one decision alone not be considered a heroic act? I must say, I wish that I could take a clinic or lesson with some of these Armchair Quarterbacks. Because I will freely admit that I just didn’t see all of these horrible things that everyone else did in the video I watched. The horse is in good weight, muscle and tone. He appears healthy and willing. He was not swishing his tail, pinning his ears, visibly sucking back or showing other signs of overt resistance. I understand that at some point in the video, Parzival does start to stick out his tongue—this is a classic symptom of a contact/connection issue, and it certainly can indicate an unhappy horse. However, I was unable to see that in the footage I watched. I have seen some photos of him from Rio with his tongue out; they were all taken after the horse had left the ring. I saw a lovely horse performing the Grand Prix, whose rider sensed was not himself, and who was pulled up. We know he had had something wrong with his face before the competition– a fact that Cornelissen doesn’t deny and in fact shared freely with fans. There is a perfectly reasonable explanation why the horse was not at his best, especially in the connection. Let’s not forget, he was cleared to compete by some of the best vets in the world. I must really not know much about horses or dressage. But these Armchair Quarterbacks really do seem to know EVERYTHING about the training, management and performance capability of this foreign based pair. I found the amount of energy spent condemning Cornelissen to be, frankly, disappointing. One woman actually is threatening to sue Cornelissen over her alleged abuse of Parzival. I wish I was making this up. This article really resonated for me, because in my years in the industry I have certainly heard tales of “those things which happen behind the barn”. The stuff that no one talks about but people know about. It happens in all equine sports, at all levels. And it is not right, and just because it is the “norm” in a certain sphere doesn’t make these activities ok. This isn’t about saying one discipline is better than another. This is about good, basic, horsemanship. Is it possible that Cornelissen has inappropriately used rollkur, or strong bits, or other less than ideal methods to achieve a training end with Parzival? Sure. I don’t know one way or the other, because I have never spent time watching her work, or touring her facility. But I do know that the horse at 19 was sound enough in brain and body to be chosen for the Dutch squad and then flown half way around the world to represent them. So I surmise that he must have a pretty good crew of people taking care of him to get to that point—Cornelissen included. If you want to pick on Olympic riders, maybe we should condemn all of them, and our federations while we are at it, for choosing to bring their horses to compete at a Games in an area with an active glanders outbreak? Certainly exposing some of the best in the world to this nearly unheard of disease is worthy of outrage? Years ago, as a working student for Lendon Gray, she would really get after me for using a “half way aid”. She argued that it was far kinder to a horse to make your point once—give them a clear aid with a particular expectation of a response—than it was to nag, and nag, and nag. This lesson has really stuck with me. The fact is that daily training can be cruel too—too tight nosebands, excessive or uneducated use of spurs, aggressive use of training aids like draw reins or bigger, harsher bits, heck, even ill fitting saddles, can all cause pain and frustration in our equine partners. And let’s be honest—a rider who chooses to show mid level dressage but can hardly sit the trot, someone who wants to jump but refuses to learn to see a distance, the pleasure rider who doesn’t bother to learn about basic conditioning…are these not their own forms of cruelty to our beloved horses? The honest to gosh truth is that if you really feel fired up and want to make a TRUE and IMPACTFUL difference to the lives of animals…start with yourself. Educate yourself. Learn from the best that you can afford. Practice. Eat healthy. Stay fit. Reach out to your friends, your neighbors, your colleagues and your clients….help them to be the best that they can be too. There are absolutely examples of truly heinous training methods which are employed by riders to extract a certain performance from their horse. But for the Armchair Quarterbacks to vilify someone the way they did Cornelissen, without first taking a good, hard look in the mirror, is to me as much of a crime. I only can hope that this vocal contingent can take some of that energy and direct it closer to home—where it can make a real, meaningful difference. A few months back, I was reading some older issues of Practical Horseman, and I pulled an article titled “Learning from Olympic Pressure”, by Melissa Roddy Wright, from its May 2012 issue. The article was about a talented and ambitious young professional, Clark Montgomery, who had seen himself short listed but ultimately unsuccessful in making the team for the 2008 Beijing Games. At the time of this article, he was working towards the goal of being selected for the 2012 London team. If you follow eventing, you will know that he wasn’t—he made the short list again—but just a few weeks ago was named to the squad for Rio on his longtime partner, Loughan Glen. I have read many “spotlight” articles on riders from different disciplines, and I almost never find the stories so captivating that I save the article for future review. But this one about Montgomery was different, and when I saw that he was chosen for the 2016 Rio team, it seemed a fitting opportunity to tell you why I found his story compelling. Clark Montgomery and Up Spirit. This photo is on his website, and I found it on Google Images…no credit to photographer. Happy to edit if someone knows where it comes from! While all riders and trainers make mistakes, not all learn from them. It seems like for Montgomery, missing out on the team and then experiencing a fall which resulted in a serious injury to his mount caused him to reassess his entire training philosophy. We all encounter resistance in our mounts occasionally, and one of the hardest parts of training is knowing when to push more, when to back off, and when to stay the course. When you add into the mix a goal—and most equestrians I know are goal oriented people—or a deadline, you have a recipe for pushing too hard, too fast or too much. If you are lucky, your horse forgives you for your momentary loss of sensitivity or intuition, but more often we end up creating a really engrained training problem. And worse, we diminish the relationship which we have with our horse. I personally am nowhere near as driven or competition oriented as those riders with international ambitions. But if I am honest I have still struggled with this balance with my own horses. Anna will hopefully make her Second Level debut next week; her medium gaits lack uphill balance and need better engagement, her connection is not steady enough, especially in the canter, and she could be more supple. We have been consistently in the 60’s at First Level for two years, though, and I just feel like it is time for us to move on and to push to demonstrate the requirements of the next level. The perfectionist part of me wants to wait until all the details are in place. The practical part of me says that you have to get your feet wet sometime, and in dressage, usually the worst that happens is you get a low score. Anna and I after a test in 2015. Ultimately, I decided to go for it—because I think that for Anna, increasing the challenge improves her focus and her willingness to try. In preparing her for harder work, it is necessary to really wake her up a bit, but she is never resentful or shows any signs of stress or being overpressured. We are still working to figure out exactly what routine works best to initiate her forward thinkingness, and it is clear that some of the approaches which work well with other horses don’t work with her. She has challenged us to be more creative and me to be better about how I use my aids and where I sit. With Lee, I am still aiming for the long term/big goal of completing the three day 100 mile ride at GMHA in early September. We didn’t have the early spring prep that I had hoped for, with a stone bruise, a cancelled ride, and a longer than expected period of adjustment to the arrivals of new equine residents to our farm this spring. I had to regroup and reassess, and while I am still hoping to try for the 100, I am fully prepared to stand down and refocus if she requires it. We are entered in the two day fifty in Vermont in early August, which will be our final competitive ride before the 100. Again, it has been and will continue to be critical to watch her behavior and demeanor to see if she is responding well to the increased demands in fitness. Montgomery says, “In day to day life, that means watching each horse carefully for the signals they send, both under saddle and in the barn.” A true horseman knows their mounts inside and out. Lee at the awards ceremony for the 25 mile ride at GMHA Distance Days, 2014. So while I am not on the hunt for an Olympic berth, it was really inspiring to read how such a talented and seemingly reflective professional at that level was able to learn from his mistakes in a way which allowed him to find a better path. I guess it doesn’t matter whether your goals are international or local in nature, all horsemen have an obligation to do their best by their horses. Treat your horse as an individual. Have goals but be ready to revise them. Try to really listen to what your horses are saying. They are only horses, after all. Our ambitions are not theirs. But their willingness to cooperate with us to reach our goals is a pretty amazing and special gift, if you really think about it. Literally while I was writing this blog, I received an update on Facebook about the current standings at Great Meadow International CIC0***. Read here to learn more. I have been lucky enough to know Cindy Canace, a USDF Gold Medalist and USEF “S” dressage judge from New Jersey, for many years. However, this past week was my first opportunity to actually ride with Cindy in a clinic setting, and it was a great occasion to learn more about her training philosophies. Annapony and I had just ridden several tests in front of Cindy at the recent University of New Hampshire dressage show, so she had a current picture in her mind’s eye of where things were at with us in the competition arena. Cindy pointed out that a clinician’s main job is to provide a fresh set of eyes, and not to usurp the place of a regular instructor. Specifically for Anna, Cindy wanted to challenge the honesty of her connection to the bit and work to achieve increased throughness. For a horse competing at First Level, Cindy says that she would rather see a more open position in the neck with good energy and balance than a horse which has been pulled into too tight or restricted of a shape in the neck. This is probably one of the reasons why Anna has scored well in front of Cindy, but as we are working towards moving to Second Level, it is necessary to achieve a greater degree of roundness and uphill balance. Anna would prefer to be too open in the throatlatch if left to her own choices; because the purpose of Second Level is partially to confirm that the horse is “reliably on the bit”, we will need to work to erase this. Cindy had me move my hands closer together along Anna’s crest and ride with a much shorter rein than where I would tend to carry it. “Put the bit where you want your horse to go” was a message repeated many times during the session. She emphasized that the rider needs to keep her arms elastic, her shoulders down, her neck soft and her hands forward. Cindy wants the horse to truly be seeking contact with the bit; it is the horse’s job to reach towards the bit all the time, rather than the rider taking the bit back towards their own body. One of my greatest challenges is that most of the time I ride on my own; when you do this for too long, it is easy to pick up little bad habits. One of my current ones is using too much inside rein, which blocks the inside hind and causes too much neck bend. To help “reprogram” my aids, Cindy had me ride a diamond shape. Imagine a square set within a circle, with points placed on the center line and equidistant from these points on the walls in between. To turn Anna at each corner of the diamond, it was important to keep the inside leg at the girth and to bring the outside leg slightly back, pushing her around primarily with the outside aids. I then used the inside leg to stop the turn and pushed Anna slightly out towards the outside aids again while aiming for the next point. We did this at the trot and the canter, decreasing the size of the circle as we became more proficient. Can you tell how awkward I feel with my hands this forward? For me, the hardest part was to keep my hands out and ahead of me (‘put the bit where you want your horse to go’), even when Anna became less round or didn’t turn as crisply as I wanted. The thing is, when your horse has gotten used to you supporting them in a particular way and you stop doing that, it takes them a few repetitions to sort things out for themselves. Cindy reminded me that whenever I am tempted to pull on the inside rein that I needed to engage my inside leg instead. At this, I had to chuckle—I must give this instruction myself many times per week, but it is good to know that even we instructors need reminders! Cindy also had me use a little sense of leg yield into the downward transitions to increase the connection to the outside rein, another technique which I like to use regularly. It is always good to know that your instincts are on the right track. Cindy is wonderfully complimentary towards the rider’s horse; having ridden in many clinics, I think this is an important quality. Clinicians only get a snap shot of a horse and rider, and it is nice to hear what their immediate impressions are of the partnership. While I usually think of Anna as not being super forward thinking, Cindy commented that my pony has a good overstep in the walk and trot; the more elastic and forward thinking that I keep my arm, the better Anna reaches through her topline and into the bit and the better the overstep gets. While discussing the importance of overstep (when the landing of the hind hoof reaches past the print of the front hoof on the same side), Cindy reminded auditors that there is a difference between fast and forward. She says that in her judging, she sees too many horses which are being ridden so energetically that they move with a fast, quick tempo, causing the quality of the horse’s balance to literally go downhill. While activity in the hind end is required to get true reach through the horse’s back, it cannot be accomplished at the cost of balance. Many thanks to On the Bit Events and the University of New Hampshire Equine Program for co-hosting this clinic! Most of us who are involved with horses and horse showing prefer to be seen as both good horsemen and good sports. If you stay in this game long enough, you will learn that when your success is predicated on the cooperation of a 1000+ pound flight or flight animal that also has a seeming proclivity for self-destruction, it is important to stay humble and not become too greedy. With that being said, doing your homework, carefully prepping, setting goals and hopefully achieving them are all totally reasonable expectations. In fact, these qualities are probably ideal in terms of making any sort of progress at all. It is pretty easy to be a good sport when things are going your way, and you feel successful. But where you are really put to the test is when the deck is stacked against you or the outcome isn’t what you had hoped for. It seems that for some people, the ability to persevere and to continue to demonstrate the highest levels of sportsmanship and horsemanship comes naturally; nature vs. nurture, maybe. Others of us have to dig a little bit deeper and consciously choose to maintain our best selves in these difficult times. I have been reading a stack of old Dressage Today magazines, and I came across an “On Deck” column in the November 2007 issue written by a young lady named Holly Bergay. At the time, Holly was just 15 years old. 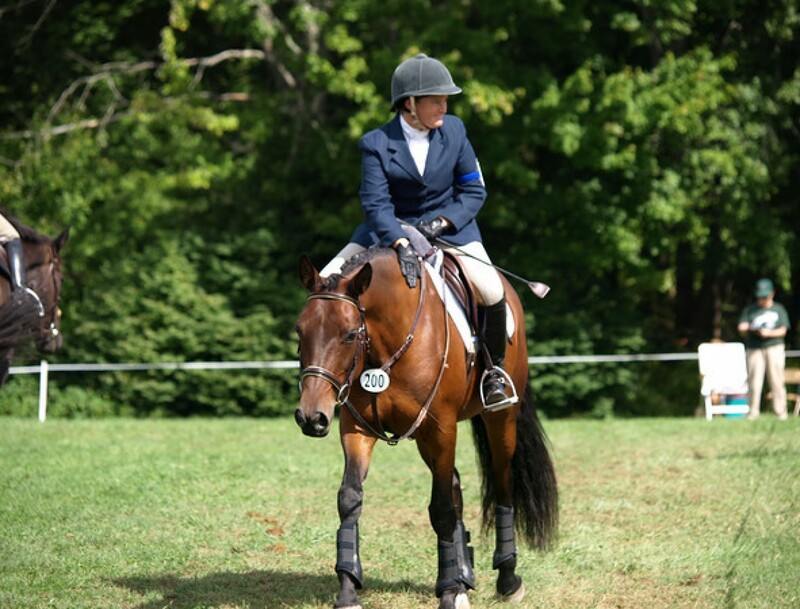 She wrote about her first experience competing as a junior at the NAJYRC. Now, I know what you might be thinking (because my brain would go there too)—to make an NAJYRC team, riders have to be talented and have access to both high quality horses and coaching. It is easy to assume that these riders enjoy a certain amount of support and privilege that others do not; that their path has been made easy for them. But when you start really talking to each individual rider, you will quickly learn that for most, there is a veritable army of people helping, contributing, supporting, fundraising, loaning horses, offering coaching, etc. Holly was one of these riders; based in Arizona at the time, the expense alone of shipping all the way to Virginia for the competition must have been daunting for her middle class family. And there is one other detail about Holly. She was born with no left arm below her elbow, making her “the first disabled rider to ever compete at NAJYRC against able-bodied riders” (her words). Holly tells the story of her and her teammates’ experiences at the competition; she rode for Region 5, and all of her teammates came from the west coast (Colorado, Arizona and Utah). Though they were used to competing against one another, the riders didn’t really get to know each other until the trip east. You might think that the hard part was qualifying for the Championships and then making their long trek to Virginia. But the Region 5 team’s challenges were far from over. One rider never even got to make the trip because her horse colicked before leaving home. Another horse failed the initial jog (fortunately only due to an abscess, but still, what rotten timing). Yet another rider arrived for day one of the mounted competition to find that her horse had ripped his eyelid open on a bridle hook, necessitating medical treatment which precluded him from competing. I am sure that for these riders, who had invested so much of themselves in getting to this point, these events were terrible disappointments. Yet according to Holly, her teammates showed “phenomenal horsemanship” in dealing with these blows and “made us all truly appreciate the opportunity to show”. They learned to cheer for those who were still riding in the competition, even though with only two Young Riders left, the region’s team was ineligible for awards. Can you imagine feeling that way, at just 15 years old? I found Holly’s voice refreshing and her attitude moving. Interested to know where Holly was now, I Googled her name (isn’t the internet wonderful)—and what came up showed me that the young girl of fifteen has matured into an inspirational young adult of twenty four. And in the years between her debut at the NAJYRC and now, she has faced her own share of highs and lows, success, challenges and disappointments. Holly and Grand Ballerina (taken from her Facebook page). After returning to compete in the NAYRC in 2008, Holly became internationally ranked in para-equestrian; in 2012, she was named to the World Equestrian Games team on the horse Grand Ballerina. The mare unfortunately went lame just prior to the competition and so she was unable to compete. After the financial investment incurred during the qualification process, followed by the disappointment of having to withdraw, Holly gave up riding altogether for a period of time. But she returned to the sport and with the assistance of owner Violet Jen, Holly began to ride and compete the Hanoverian stallion Rubino Bellissimo. The team entered the 2014 Para-Equestrian National Championship ranked second in the nation, and were considered strong favorites for selection to the World Equestrian Games team set to compete in Normandy, France. Holly and Rubino Bellisimo (taken from her Facebook page). Over $10,000 was raised to get Rubino and Holly to the New Jersey competition. Just days before they were set to compete, Rubino began to exhibit signs of discomfort. According to a story in the San Diego Union-Tribune, Rubino’s condition quickly deteriorated and he was diagnosed with a malignant tumor that had begun to spread to muscles, nerves and bones. With no hope of recovery and a rapidly declining quality of life, he was euthanized with Holly at his side. Holly and Rubino’s last performance together. I can’t even imagine going from the expectation of success and possibly achieving a dream such as qualifying to represent your country in international competition at that level to the devastating loss of a partner and friend in just a few days’ time. It takes some kind of degree of sportsmanship and horsemanship and heck, just sheer grit, to keep pushing through that kind of challenging emotion. And when you add to that the fact that your bank balance doesn’t rival that of a rock star or internet mogul, and you know just how much others have invested in your goals to support you—it weighs on you. In the same Union-Tribune article, it says that Holly went to her family’s home in Colorado to grieve the loss. Then she planned to return to her business in California, the San Diego Saddle Club, to regroup and possibly begin again. She specifically mentioned the amazing community of horse people in the San Diego area, and that she either hoped to find a young horse to bring along or find another opportunity. I can find no mention of her for 2015, so I have no idea where she stands today. While you and I might not be on the short list for Rio, each one of us goes through some version of this struggle each and every day, don’t you think? Learning to take the highs and the lows, to make the best decisions for ourselves and our equine partners, and to do our very best to just be grateful that most of the time, we even have the opportunity to do the amazing things we do with our animals. To try to find the balance between our competitive ambitions and the needs of our horses, and to know when it is ok to push a little harder versus when it is better to call it day. I certainly admire Holly’s perseverance in the face of multiple challenges, and you just have to hope that if she can hang in there a bit longer, some of her fortunes will turn. I have never met Holly, but perhaps if she ever reads this she will know that her story has touched another horseman and that I am rooting for her, wherever her equestrian pursuits might take her. Our sport needs horsemen and sportsmen like Holly. Spring has come early to these parts, and with it the itch to get out and about. After a two month rest during the heart of winter, the Dark Mare is working on getting legged up for what will hopefully be a full season of competitive trail riding. My big goal is to successfully complete the 80th anniversary three day 100 mile ride at the Green Mountain Horse Association (GMHA) in South Woodstock, VT, in September, the centerpiece of its Distance Days weekend. Lee and I completed this ride in 2015, both of us rookies to the sport. It was singularly one of the most amazing and rewarding experiences that I have ever had with one of my horses, and I have been able to meet so many enthusiastic, helpful and fun people as a result of the training and preparation that went into it. “Team Peanut Butter and Jelly”, GMHA Distance Days 2015– Kat Waters and High Brook Quintessential, me and Lee, Robin McGrath and Aikanes Sunflower. We did the 100 miles together. The 100 mile ride is the marquee event of the festival of trail riding that is Distance Days. There is truly something for everyone; if you enjoy amazing scenery, challenging trails, the camaraderie of fellow trail riding enthusiasts and the opportunity to pursue personal goals, Distance Days is for you. Here are five reasons why YOU should plan to ride at the GMHA Distance Days. 1) Become a part of history. The GMHA 100 Mile ride is, as ride manager Chelle Grald describes it, “the granddaddy of them all”. Begun by the fledgling GMHA organization in 1936, the ride initially was held in Rutland, VT, just over fifty miles away from its current home in South Woodstock. It was the first ride of its kind, and it remains the oldest distance ride in the US, predating the famous Tevis Cup endurance ride by nineteen years. It has run every year without interruption, with the exception of 2011 (you may remember a little storm called “Irene”, which blew through just before the ride weekend, leaving a good chunk of Vermont underwater….). GMHA was founded as an “altruistic organization” for the purpose of encouraging the breeding and use of horses in the state of Vermont, as well as to develop a system of bridle trails throughout the state. In its early years, over one thousand miles of trails were marked, traversing from the Massachusetts state line in the south to the Canadian border. Dues in the early years were just $2.00, which included a subscription to their magazine. The 100 mile ride quickly became the highlight of the organization’s annual calendar. Part social event and part horsemanship demonstration, riders came from as far away as Indiana and Virginia in the early years; some riders actually RODE to the ride, covering over three hundred miles before the competition even had begun. Riders ran the gamut—children as young as nine were known to complete the ride, and men and women alike delighted in the thrill and challenge. Mrs. Fletcher Harper, a passionate foxhunter, won the 100 mile ride riding side saddle. Mrs. Fletcher Harper, who by all accounts was a fearless rider, jumping downed trees on trail while others searched for a route around. Photo from GMHA archives. All manner of horses have successfully completed the GMHA 100 mile ride—Welsh ponies, mules, Thoroughbreds, Morgans, grade crosses, and of course, the now ubiquitous Arabians. Families would line the route to cheer on the riders; for many of these non-equestrians, it was THE social event of the summer. In its heyday, the ride had hundreds of entrants and a wait list. Distance Days represents the opportunity to participate in a piece of living history, to add your name to an ever growing list of riders (and horses) who tackled the challenge of traversing the rugged and beautiful terrain of the Kedron Valley. You are quite probably reading this right now and thinking, “well, that sounds pretty amazing, but 100 miles is a LOOONG way.” You are totally right. Maybe you aren’t up for that challenge quite yet…. And that is why Distance Days offers more than just the 100 mile ride. There will be five other ride lengths for competitive trail riders: 15, 25, 35, 40, and 60 miles. The 60 mile is a two day ride, but the other rides are all one day long. The entrants on these rides will be sharing the trail with the 100 milers, and so if you and your horse aren’t up to the rigors of the full 100 miles, you can still get a taste of the ride on these shorter routes. The 100 mile ride covers the 40 mile WHITE trail on day one, the 35 mile RED trail on day two and the 25 mile BLUE trail on day three. These trails cover terrain in the towns of Woodstock, Reading, Hartland, West Windsor and Hartford, and visit such historic and classic Vermont landmarks as the Marsh Billings Rockefeller National Historic Park and the Taftsville Covered Bridge. The historic Taftsville Covered Bridge has long been a highlight of the 100 mile ride. The original bridge was destroyed by Hurricane Irene but was restored in 2014. The bridge will be included on the 2016 route. Photo courtesy GMHA. Another aspect of Distance Days that is super cool is that the ride management has come up with a unique idea for this 80th anniversary weekend: the 100 mile team relay. There are several options, but basically 2-3 riders can make up a team, and by completing the requisite combination of shorter rides, can collectively complete the 100 mile distance. Special awards will be given to the team with the best average score over all their rides. If one rider were very ambitious but didn’t have one horse that could do all 100 miles, they could do each chunk of the distance on a different horse, or do 2/3 on one and the rest on another. See, you could be a 100 mile rider yet! Competitive trail riding is sort of unique among horse sports, because you really and truly are competing against yourself; rather, you are trying to use all of your horsemanship expertise to bring home a horse that is no worse for the wear after covering your chosen distance. Horses all start with a perfect score, and at the end of the ride, they are compared to their starting condition. Points are deducted for negative changes. But some people really just aren’t into competing, and that is totally ok—Distance Days has something for them, too! CTR requires travelling at a faster pace than what many recreational trail riders might choose, and this could be another good reason to go with the Pleasure Ride option held on Distance Days weekend instead. Lee completes her first two day 50 mile ride at GMHA in 2015, with her friends Roxie (middle, ridden by Denny Emerson) and Camille (ridden by Robin Malkasian). Pleasure rides will be offered on Friday, Saturday and Sunday of Distance Days. You can do any and all combinations of day(s). On Friday and Saturday, riders can choose from short (6-8 miles), medium (12-15 miles) or long (20 miles) options. On Sunday, riders can pick from 6 or 10 mile options. Horses and riders which finish the entire weekend’s worth of long options (so 50 miles total) will complete the 50 Mile Pleasure Horse Challenge, and will be recognized at the Sunday awards ceremony. Let’s be honest—there aren’t too many places which can beat Vermont in the late summer when it comes to stunning views, the hint of fall color and crisp, clear air. The Kedron Valley is an especially picturesque region of the state, with many classic New England style farm houses and barns, stunning estates, covered bridges and burbling brooks. Trails in the area are a combination of the quintessential Vermont dirt road and wooded routes. And of course, there are the hills. No one will deny that a horse and rider must have a certain degree of fitness to handle them. The route covered during the Distance Days weekend tackles several of the most rigorous in the area, including Cookie Hill and Heartbreak Hill, for a few. But the reward for the climb to the summit is often a panoramic, expansive view, hearkening back to a time when horses were the dominant mode of transportation and the ‘conveniences’ of the modern era were far in the future. The popular equestrian travel website www.equitrekking.com featured the trails around GMHA in its “50 States Trail Project” as the ‘place to visit’ in Vermont. You can read more about it here. The themes of “friendship, sportsmanship, horsemanship and love” are the dominant motivations for most of those who choose to tackle a challenge such as the three day 100 mile ride. Grald has decided to highlight the significance of each of these important values in the commemorative Distance Days Program, which will be given to all entrants. Included in the program will be vignettes from riders past and present, photos and even the recipe for the tasty Cookie Hill chocolate chip cookies. Distance Days will feature several opportunities to socialize as well as to honor the contributions of the volunteers and landowners, without whose generosity these sorts of experiences would not be possible. The 100 Mile Banquet will be a fancy affair, to be held at the Woodstock Country Club and chaired by longtime Woodstock resident Mrs. Nancy Lewis, who rode in the 1946 100 mile ride. A special presentation by historian and author Dale Johnson at the banquet will spotlight the role of the historic Woodstock Inn Stables in the early years of the ride. Riders have a chance to thank landowners for their support at the catered BBQ on Friday, allowing a fun and informal opportunity to share memories and fun. Between the finish and awards ceremony on Sunday, 100-mile alumni will gather for a Longtimer’s Reunion. Finally, Sunday’s awards ceremony will follow the traditional catered brunch. This ride has given many future endurance riders their first taste of serious distance riding, and has taught them the fundamentals of good horsemanship that these sister sports require. Judges Dr. Nick Kohut (current president of the Eastern Competitive Trail Riding Association) and Linda Ferguson Glock will bring their extensive experience as riders, organizers and volunteers to the weekend. Dr. Joan Hiltz will work with riders on the 15 mile ride. Each step of the way, horses are closely monitored by their own riders but also by these experienced horsemen, to ensure that the animals’ care and well-being remain of the highest priority. Denny Emerson is just one of many horsemen who got their start in distance riding at GMHA. Emerson has gone on to complete the Tevis Cup and 2300 endurance miles. Photo courtesy GMHA. In spite of its legacy, rides like the GMHA 100 mile can only continue to flourish with the support of riders who are interested in participating in the shorter distance events which run concurrently with it. With continued loss of open space to train, amongst other issues, fewer and fewer riders have the time or inclination to commit themselves to preparing a horse for such a rigorous challenge as a 100 mile ride. Events like Distance Days are incredibly important, because they draw together all of the diverse types of rider who are ultimately united through their love of horses and “riding out”. I don’t know this for a fact, but my hunch is that there isn’t a single equestrian who hasn’t, at some point, experienced the limiting effects of fear. Fear plays an important role, evolutionarily speaking, in keeping us alive. Fear itself is an emotional experience which triggers biological responses; for many species, it triggers increased heart rate, respiration and muscle tension, and a heightened state of alertness. Horses as a prey species are well known for their genetically driven “fight or flight” response to unfamiliar stimuli, and it is only through careful and systematic desensitization and conditioned response training that we humans can work to overcome some of these natural reactions. But as much as the human species has tried to separate itself from other animals, the truth is that many decisions in our lives are still driven by fear, manifested by our own fight or flight response to situations which we think might cause us harm. A few weekends ago, the UNH Equestrian Team attended a sports psychology seminar with Alannah DiBona of Windhorse Counseling. DiBona reminded all present that fear is a normal response to a situation which our brains think could cause us physical or emotional harm. DiBona defined fear as “false evidence appearing real”, and told the riders that it is necessary to examine one’s fear in order to truly address it. “Is the fear serving you in any way, or is it preventing you from doing something you want to do?” DiBona asked the audience. Fear is a funny thing, because very often it is the things which we want the most which can simultaneously scare us—this is true not just when it comes to riding and our equestrian goals, but to all aspects of our life, whether we are starting a new job, buying a house or falling in love. And fear can really limit us. There are plenty of tips and strategies as to how equestrians should address fear in their riding. But I guess it always comes down to that essential question: are you feeling fear because of the actual task or expectation in what you are doing, and its accompanied level of risk, or do you feel fear because in your heart of hearts, you don’t want to do what you think you want to do at all? Anna jumping the ditch and wall at Ledyard. I was way more worried that she was. For the riders I work with, jumping in particular seems to trigger a large number of fear responses. All riders (and horses) have a limit in terms of what they will be comfortable jumping in terms of height, technicality or speed. But I feel like I work with a lot of riders who are on the line of needing to decide whether their fear is serving them or not. In their mind, they think they want to jump, but when faced with an actual jumping exercise, the fight or flight mechanism kicks in and renders their aids ineffective. People ride for a lot of different reasons. But for most people, at least one of those reasons is to have fun. We enjoy being with horses, and we value establishing a relationship and communicating with an animal of a wholly different life mindset (prey vs. predator). There is no written rule that overcoming fear should be a part of your daily riding ritual, and having to do so doesn’t make you tougher; it just makes you suffer. I think when a rider is starting to have recurrent physical and/or emotional manifestations of fear, it is time to consider why they are riding and what they hope to get out of it. There are tons of ways to enjoy being around horses, and if what you are currently doing isn’t allowing you to do that, it is time to make a change. This whole thought process is a corollary for me right now in another aspect of my life. Thinking back to my earlier blog post about “living a sustainable life”, I think it is critical to analyze what you are doing when you feel like your wheels are spinning and you aren’t getting anywhere. Fear can cause us to keep repeating the same familiar patterns over and over, even though we know that they aren’t working for us or are keeping us from doing something which is much more supportive of our core values. There is a post circulating on Facebook which says something along the lines of, “instead of thinking of it as not having time to do something, think of it as “it’s not a priority””. Try it and see how it feels. “I don’t have time to ride today” vs. “It isn’t a priority to ride today”. I think that is a pretty powerful way of looking at things. Right now, fear is currently preventing me from acting on something which has caused me a great deal of anxiety, frustration and anger. I know that responding to this action against me is a priority, but the question becomes whether my fear of the possible consequences of that response is enough to still hold me back. When it comes to fear, it might not be any easier for my students to jump an oxer than for me to deal with my personal situation. Such is the nature of fear. Certain events have occurred within the past week and change which have put me into a reflective mood. Most of us don’t like to think about the “hard stuff”—death, separation from loved ones (human or otherwise), accidents, disasters (read my blog on this last here), etc. But whether we choose to acknowledge these things or not, they are a part of life. Ignoring their existence is irresponsible. When it comes to our horses, the consequences of disregarding them can be gut wrenching. Do you have a plan for what would happen to your horses if something should cause you to be unable to take care of them anymore? I suspect that many horse owners do not, and instead just sort of assume that a friend or family member will step in to make decisions regarding our horse’s care or potential rehoming. But this puts an extreme burden upon loved ones who may or may not be up to the task. How many times have you read a story of the family member who meant well, but didn’t feed/water/shoe the horse? Or the pets brought to the shelter because no one in the family had the wherewithal to take additional animals into their homes? A fellow blogger shared a somewhat unsettling story about a veterinarian friend of hers who has been saddled with the task of placing twenty four horses after their owner passed away. The owner had suffered a period of failing health but was unwilling to rehome any of her animals, choosing instead to provide for them in her will. Unfortunately, most of her horses are unbroke, older and unregistered—all common reasons for animals to end up in the auction pipeline, sent to an uncertain fate. Clearly, this owner loved her animals and couldn’t bear the thought of parting with them while she was still alive. Unfortunately, making this choice has perhaps precluded the possibility of most of these horses finding appropriate new homes, and has placed a tremendous, heartbreaking burden on her friend. A friend of mine passed away last week after a long fight with a terminal illness. We hadn’t been in touch for a long time, but shared several years of friendship and I feel lucky that the picture of her in my mind remains of a time when she still was robust and in good health. Her beloved horse, which she bred and trained herself, is safe at the farm which has been his home for eighteen years. He is in good hands there, and care will be taken to find the right placement for him; I suspect he would always be welcomed back, should that be needed. But no one will ever have the intense, empathetic bond with him that she did, and the sentimental part of me grieves for a loss which he likely doesn’t conceptualize. University programs like the one I work at are frequently the recipients of horses whose usefulness has passed for their owners. Often, these animals are unsaleable due to age, soundness or other variable, or would only fetch a fraction of their original purchase price, so owners looking to move on are often open to the possibility of a donation. I think that many donors are comforted in knowing where their horse is going to end up, and are satisfied to know that it is unlikely that the animal will be passed from place to place, to an uncertain end. Our lovely mare Morocco, who came to us after her owner passed away unexpectedly. But the hard reality is that we can’t keep the horses forever, either. At UNH, our informal policy has been that as our horses approach 20, we try to find new homes for them, while they are still sound and happy. Prospective adopters are carefully screened, and it is nice to know that many of our beloved school horses get to enjoy their golden years one on one with an owner who loves them. But sometimes, the factors which caused them to be difficult to rehome in the first place come back to haunt them, and we the human caretakers are faced with tough choices. During the first week of our spring semester, one of our older school horses sustained an injury in my class. We were longeing, as we always do at the beginning of the term. This horse in particular longes quite well and has been used many times in our longeing classes to teach newbies the ropes. On this particular day, he had longed quite quietly at his end of the arena with a competent and experienced student, while the horse at the other end was being all sorts of sassy and fresh. We got that horse settled and into a more obedient and working attitude, when for no apparent reason, our veteran school horse decided to take one lap on the line leaping and bucking. None of us even saw him take a funky step—but suddenly he stopped short, holding up his left front leg, trembling head to toe. Ice and his friend Meri at the Equine Educational Day 2015. I had joked with the students at the start of class that this particular horse was 23 going on 5 in his mind. His “goofy” behavior on the line was just that—a few little hoo-hahs from a horse feeling playful, nothing naughty or dangerous. I guess it was just a little too much on older legs on that day at that time. In all my years of working with horses, this is the first time something like this has happened to me. I am devastated. I have replayed the entire morning over and over again, tossing and turning through nights with sporadic sleep, wondering if I made an error in judgement. But what I keep coming back to is this—we did nothing differently that day than we have done hundreds of times, each semester, for many years. We all know how fragile and delicate these animals are, for all of their strength, endurance and stoicism. There was no obvious previous indication that anything was brewing or off with this particular animal, and up until the moment where things were not ok, all had been proceeding totally like normal. This horse is currently on stall rest. So far, he is coping ok, and after the first day or so, does not seem to be in undue amounts of pain. But the preliminary diagnosis is fairly bleak, and at 23, the question becomes whether it is fair to even attempt the rehab such an injury would require. My friends and colleagues have been supportive, reminding me that it is not my fault, that such an injury could have happened at any time. I would say the same thing to them if the roles were reversed; but it was I who was teaching that day, and it is I who am taking this the hardest. This is one of those times where the rational brain and the emotional heart come into conflict. As our horses’ caregivers, companions and greatest advocates, the onus is on each of us to make the right choices when these crossroads come, keeping the animal’s best interest in mind. It is not right to pass the problem on to someone else to deal with— it is our duty to consider the available resources, the possible outcomes, and make the hard calls. And I doubt that it matters how much we prepare our rational brains to accept this reality; our emotional hearts will always take it hard. It is the price we pay for love. I probably shouldn’t even be sharing all of these thoughts on here. But these are the subjects which we don’t want to acknowledge or talk about, and maybe that makes it even harder than it already is. Right now, my emotional heart needs the support.